By @SimonCocking review of Improve Your Odds – The Four Pillars of Business Success by Yong Alan. Available from Amazon here . The Four Pillars of Business Success is a business book written to help entrepreneurs, business leaders, and managers learn to develop the strong foundation every business needs to be the best in its class. 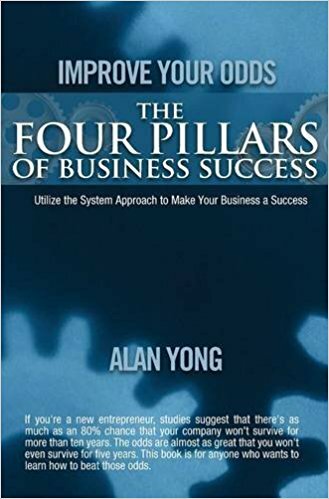 The book’s author, Alan Yong, utilizes the insights he has gained over the course of four decades in business to offer today’s entrepreneurs a roadmap to success. This book is written to help them overcome many of the most common strategic and operational challenges confronting today’s companies. In a world where more than two-thirds of all business enterprises fail within their first ten years, The Four Pillars ofBusiness Success calls upon its readers to return to first principles to achieve real and lasting success. There is an interesting person, with valuable experience stuck inside a book which is a clear example of why self publishing is not always the best route to take. The book has variable font sizings, text layout issues, and titles for new sections that appear on the last line of the page. It’s not something we like to say, but this book is a mess, no clear structure or sequence to the ideas. It reads like a series of text uploaded from a word document. This is a shame because in the final chapters you get the sense that this is written by a successful entrepreneur, who has done some really interesting things. This book has just failed to be the vehicle to demonstrate this. No illustrations either doesn’t help.